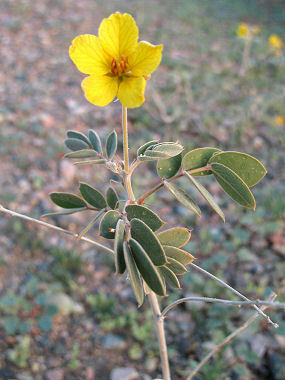 Desert Senna is a member of the Pea Family. The plant grows to 24 inches in height and has stiff, gray-green leaves that are divided into 3 pairs of 2 leaflets to 2 inches long each. The plant is considered a weed and is found along roadsides and areas where the soil has been disturbed as well as on rocky slopes, mesas, sandy river bottoms, and washes at elevations between 1000 - 3000 feet. The Two Leaf Desert Senna flowers of the Woolly Bluestar have a light jasmine scent which is used to attract nocturnal insects. Desert Senna blooms between April - October and produces a rusty yellow flowers with 5 petals to 1 inch in width wide that grow at the top of the stem. Flowers are followed by a woody seed pod to 1.25 inches in length.